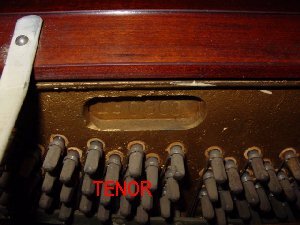 The Serial Number is typically located in the vicinity of the Tuning Pins and more specifically between the bass and tenor tuning pins. 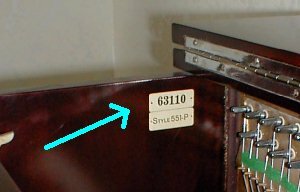 Most commonly, there is a small oval shaped hole (or cut-out) in the cast iron plate (painted gold color) and the Serial Number is stamped into the wood beneath the plate. 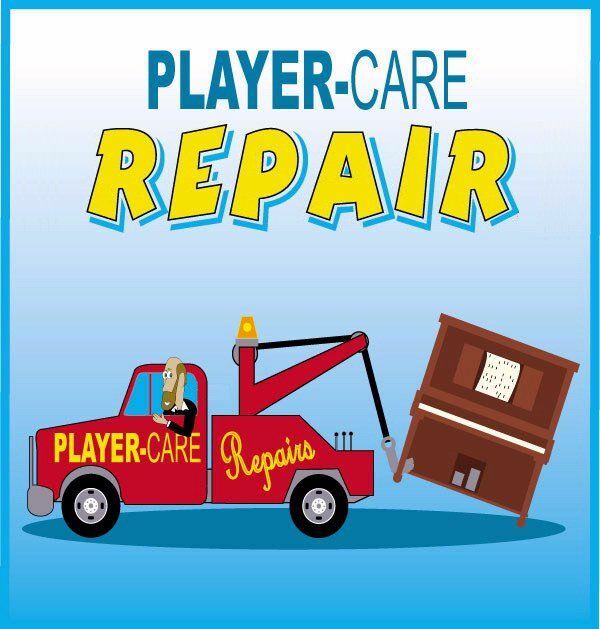 This is true for upright units and most grand pianos. Some grand piano makers stamped the number on the Soundboard but this is the exception rather than the rule. 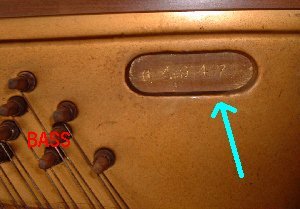 On upright units made after 1960, some manufacturers stamped the serial number on the back of the piano. This is especially true of units made by the Aeolian Corporation and Asian built units. Occasionally, the Serial Number is stenciled on the plate. And at least one maker placed the number on a fancy ivory tag which was affixed inside, near the top of the left side. The point is, it can be located in any number of places. It will usually be a five or six digit number and will not contain any letters or spaces. 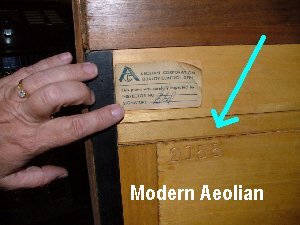 Very few makers stamped the number on the soundboard of upright pianos but I have seen three in my career. In each case, the number was made visible by removing the bottom board of the unit. The bottom board is easily removed by depressing the one or two spring clips that hold it in place, under the key bed. On rare occasions, there are two screws holding the bottom board in place. 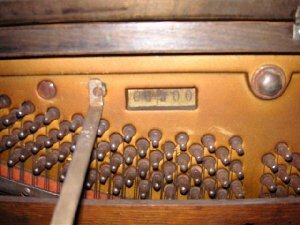 For other information about locating the Serial Number, go to "BlueBook of Piano". 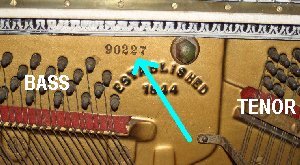 Bob Furst, the owner of The Blue Book Of Piano domain and author of the book "The Blue Book of Pianos", recently put up a new set of webpages that contain a listing of Serial Numbers that were used by hundreds of piano makers. To access the page, click here. 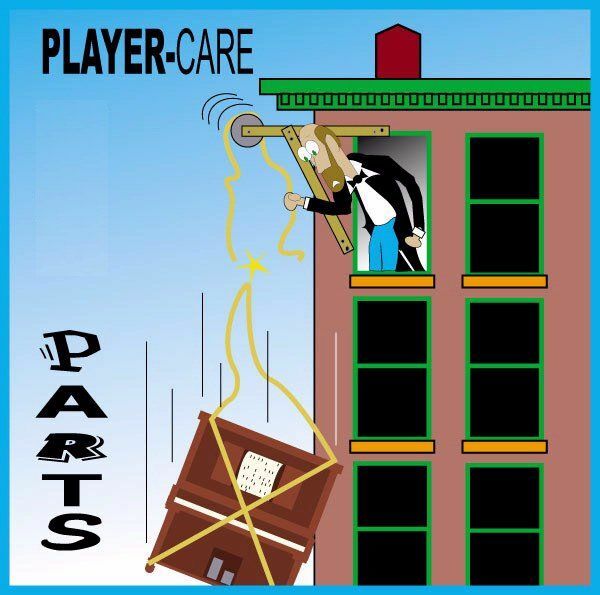 ...Back to "General Player Piano Values"